Stuttgart-based 4a Architekten renovated a 1926 villa on the French Riviera and transformed it into a gorgeous modern residence while preserving the legacy of its original architect, Barry Dierks. The designers updated the structure of Villa Le Trident by removing several interior walls to create a fluid transition between different areas. They also refurbished the swimming pool and main stairwell and introduced a variety of materials that compliment the architectural configuration of the house. 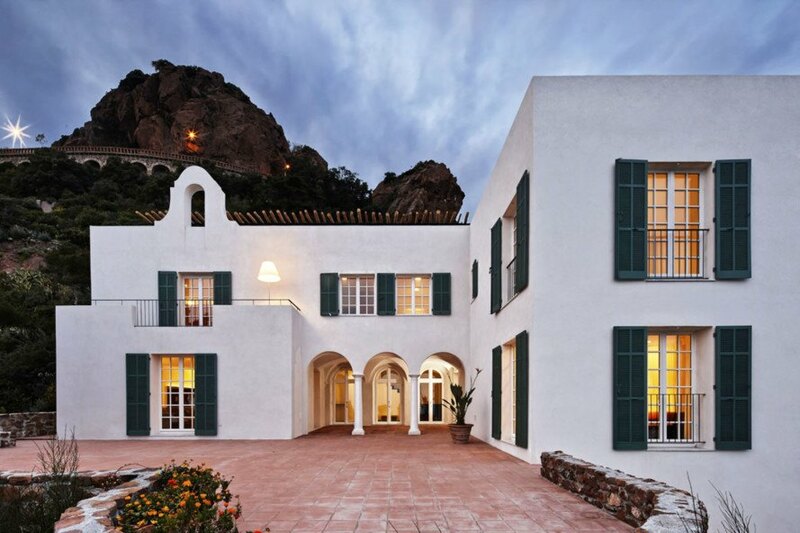 The villa was originally built for a the architect, Barry Dierks, and his partner. It was built in 1926, sold in 2011, after which 4a Architekten were commissioned to renovate the building. The team approached the assignment with a strong intent to preserve the architectural legacy of Barry Dierks, while giving the building a new, more contemporary look and organization. Some of the interior walls on the ground and first floor were removed to accommodate more flexible spatial organization and provide a fluid transitions between areas. Suspended furniture, white curtains on the external walls, solid oak floorboards and glass elements lend a bright and tranquil atmosphere to the rooms. Distinctive features include individual elements such as the furniture, a fireplace suspended from the ceiling and the wall element designed by the architects in the library. The villa was built in 1926, sold in 2011, after which 4a Architekten were commissioned to renovate the building. The villa was originally built for a the architect, Barry Dierks, and his partner. The team approached the assignment with a strong intent to preserve the architectural legacy of Barry Dierks, while giving the building a new, more contemporary look and organization. Some of the interior walls on the ground and first floor were removed to accommodate more flexible spatial organization and provide fluid transitions between areas. Suspended furniture, white curtains on the external walls, solid oak floorboards and glass elements lend a bright and tranquil atmosphere to the rooms. Distinctive features include individual elements such as the furniture, a fireplace suspended from the ceiling and the wall element designed by the architects in the library.